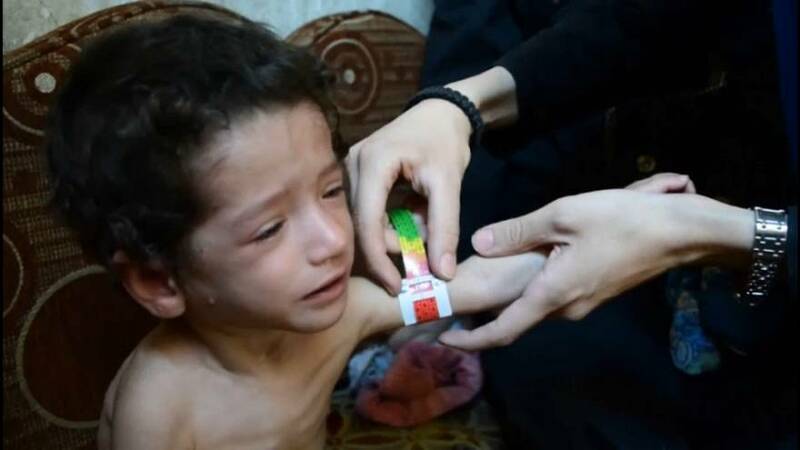 On the outskirts of the Syrian capital, one in eight children are reportedly starving because President Bashar Al Assad’s forces, supported by Russia and Iran, continues to block trucks carrying relief supplies. As the government and its opponents wrap up another fruitless round of UN-sponsored talks in Geneva, humanitarian officials warn that conditions outside Damascus have reached crisis levels. "After years of besiegement, after years of not getting the nutrition and the food they had, they are really looking skinny, everybody that we saw looks skinny, some are so hungry they actually tell us they are eating animal fodder, they are eating garbage, going through garbage. "said Jakob Kern, the Representative and Country Director of World Food Programme in Syria. "They look exhausted, they look tired, and there is despair in their eyes that I've seen in all of these convoys in besieged areas." "You're going into towns that are like ghost towns and people are still living in there." The fighting in Syria’s nearly seven-year war has tapered off in many areas since local cease-fires took hold, but the suffering in Eastern Ghouta — Damascus’ once fertile hinterland, now cut off from the world, has only gotten worse. According to the U.N., roughly one in eight children are malnourished in Eastern Ghouta — a shocking jump from one in 50 in May. "The malnutrition rate of children is alarmingly high: it used to be 2 percent in May, and now it actually went up to 12 percent," Kern said. A top U.N. humanitarian official for Syria, Jan Egeland, said last week the government is refusing to allow convoys in. It has also refused to approve a list of nearly 500 people urgently needing medical evacuation. Assad's government denies blocking off opposition areas and has said militants, who it refers to as "terrorists," are withholding aid. Close to 400,000 people are trapped without enough food, fuel or medicine. Hospitals have struggled to cope with providing healthcare, with children suffering in particular. The convoys have provided just a trickle of relief - supplies for tens of thousands of people that will last only a month or less, at a time when hundreds of thousands are in need. "The aid baskets that the UN is delivering, the local councils in Ghouta have to divide each basket in 4 or 5 parts to be enough for all the families," said Syria Charity coordinator, Mansour Abu al-Kheir. On Thursday, the UN envoy for Syria says the peace talks in Geneva were a "golden opportunity missed" as another round ended without progress after two weeks. Staffan de Mistura had seven talks with the Syrian government and 11 talks with the opposition side. "We did not achieve. We did not achieve these negotiations, in other words, negotiations in reality at the end did not take place. The government then insisted that not wanting to meet the other side, the opposition, and insisting that they did not want even to discuss through us with the other side. The opposition side said that the government is putting a precondition," said de Mistura. According to the UN, the six-year Syria crisis killed more than 300,000. Half of the country's population are displaced and 13.5 million people are in need of humanitarian aid. To rebuild Syria, at least 212 billion euros, (250 billion U. S. dollars) will be needed. Since 2016, eight rounds of Syrian talks have been held under the mediation of the UN. None has produced any big progress.